It has already been twenty years since my family (my 84 year-old mother in a wheelchair; my wife; Christopher, our 11 year-old son; and myself) attended the Mass at the National Shrine of Our Lady of Sorrows in Portland, Oregon, on the Solemnity of Our Lady's Assumption (8/15/1991) and took a photograph of Our Lady of Guadalupe. The Mass ended before noon and people crowded around the Missionary Image of Our Lady of Guadalupe placed at the right side of the altar in the church. The Image had been touring different cities in the United States by courtesy of the Bishops in Mexico, and August 15 was its last day in Portland. After the Mass, I took several photos of the Image as many other people were also doing. I wanted a good photographic replica of this precious Image in our home, but worried about the reflection of the camera flash ruining the photograph (the Image was covered with glass) if the photo was taken right before the Image. I took one before the Image anyhow and several more at different angles. We ordered more copies of this photo and gave them to others who love Our Lady. They also expressed amazement and joy. One lady in Scottsdale, Arizona, even found the image of the Holy Spirit in the same photo. Over the next months and years, we continued finding more images, which seemed to enhance the credibility of this photograph as a sign from above. (For more details. please visit this webpage). A priest in Alabama, widely known for his frequent presentations on EWTN, responded with much interest. We sent him more copies and some information on Naju. We also sent a copy to the Archdiocese of Portland, Oregon, and received a very positive letter from the Chancellor (a priest). He said that this photograph was a precious blessing and he would surely show it to the Archbishop when he returned from his trip. At that time (1991), I did not know about the proper procedures to take in such cases. In addition to the Portland Archdiocese, I also sent a copy to the Cardinal in Los Angeles, thinking that he was a strong defender of the authentic Catholic Faith and also had much interest in the Korean population in Los Angeles. Later I felt a little confused and less sure about my expectation. The Cardinal said in his letter to me that the image of an ordinary candlelight also reflected in the photograph was evidence that there was nothing special about it. Soon afterwards, the Archbishop of Portland came back from his trip and sent me a letter, too. It was given to me through the Pastor of Holy Rosary Church in Portland to which we belonged. Most of the wording in the Archbishop's letter was exactly the same as the Cardinal's, convincing me that the Archbishop had received a letter from the Cardinal before he wrote to me. Of course, the letters did not contain any order or request to stop publicizing the photograph. After this incident, I have not contacted the Archdiocese in Portland regarding this photograph again. The original Guadalupe Image has already been officially approved by the Bishop in Mexico and confirmed by several Popes. If this photograph also needs the official approval, it may be possible only after this photograph and its meaning become more widely known and accepted by priests and lay people. Anyway, I still do not understand the Cardinal's comment that, because of the reflection of a candlelight in the photograph, there was nothing special about this photograph. Until today, tens of thousands of copies of this photograph have been sent out worldwide along with the explanation sheets. Another priest in Los Angeles, who is highly respected by many other priests and lay people, also said that the image of the Eucharist in this photograph was significant, but he has not been able to see other images yet. We understand, as it has also taken a long time for us to identify the images. The mere fact of unexpected appearance of some new images in the photograph may not be anything more than an object of passing curiosity. What has made us perceive this photograph more seriously and even made us tremble with awe has been the gradually increasing awareness of the supernatural contents of the images in this photo. So, when we look at the Blessed Mother in this photo, we strongly feel that we are really looking at the live Blessed Mother. The Image is, of course, on a sheet of paper, which is worth very little, but the Image itself contains the dignity and value that totally transcends worldly estimation, simply because it is not a human product. We also believe that these different images together are portraying the predicted Triumph of Our Lady against the Red Dragon, Satan with tremendous consequences on the whole world. If this discernment is correct, this photograph may be an extremely relevant message to every person in the world. On the other hand, how can such an important thing occur through an insignificant and unworthy family like us? The answer may be that, in manifesting God's glory and pursuing His Will, any greatness, or any pretense of it, of His servants can only be an obstacle rather than a help. So, we are happy to be in our lowliness and unworthiness, but pray that we will be able to faithfully carry out the work allotted to us. In this photo, it seems that Our Lady is not wearing the turquoise veil on her head any longer but is exposing her dark hair to be ready for her crowning as the Queen of Heaven and World. The image of the Holy Eucharist at Our Lady's fingertips may indicate that she is about to open a new era of her Divine Son's reign through His Real Presence in the Eucharist. The image of the Holy Spirit above Our Lady's right shoulder may indicate that, together with His Spouse, Our Lady, the Holy Spirit will soon cleanse the world from sins and errors, while sanctifying those who repent their sins and love and follow Our Lord and Our Lady. This may signify the already predicted "Second Pentecost". The bright light (the reflection of camera flash) seems to represent the Birth of her Divine Son. The Mexican people, who are so devoted to Our Lady of Guadalupe, have long believed that she is a pregnant mother. "Pregnant" means that there will be "Birth". This light may be a sign of her Son's Birth, especially through the revitalized devotion to the Holy Eucharist worldwide. 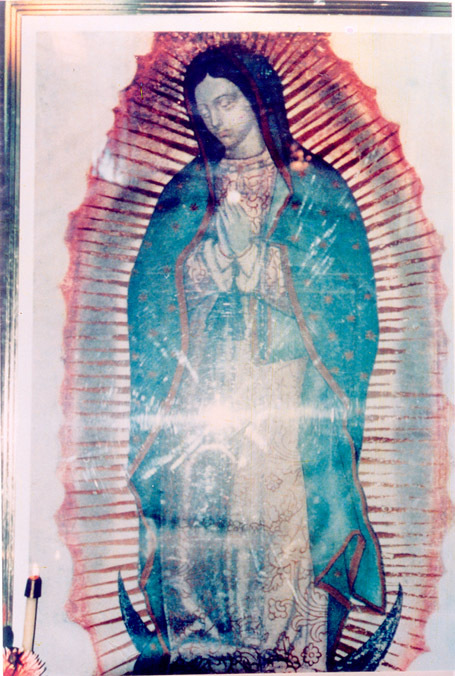 In the original Guadalupe Image, Our Lady is lifting the left side of her blue mantle with her forearm. In the photograph, the space created by the folded part of the mantle forms a heart (Read the explanation in our website) indicating that she will rescue her children from the approaching Chastisement by calling and gathering them into her Immaculate Heart. The bright light right above the head of Our Lady of Naju may mean that the official church recognition of Our Lady of Naju is somehow related to (or will be facilitated by) the revitalized devotion to Our Lady of Guadalupe, as the protagonist in this photo is Our Lady of Guadalupe. Satan (looking like a serpent) shows his ugly and grinning face behind the lower back of the kneeling Blessed Mother of Naju indicating his violent and persistent attacks on Naju, which exactly describes the ongoing persecutions, slanders, and misunderstandings of Naju. Over the past years, there have been some notable signs among those who have received this photo such as the fragrance of roses, avoidance of and protection from traffic accidents, and expulsion of evil spirits. It is not conceivable that God would add more of His special revelations to the Image of Our Lady of Guadalupe, which has been so enormously cherished and dignified in the Church for the past 480 years, just for satisfying a passing human curiosity or for other trivial causes.